Crafted in luxurious 9ct gold and set with sparkling diamonds, this distinctive ring features a beautiful interlocked cut out design that's made to stand out. Coordinate with other gold jewellery for a polished finish, or contrast with bright jewel tones for a contemporary feel. 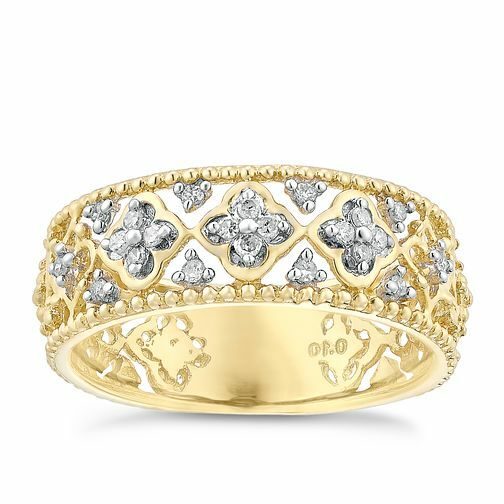 9ct gold diamond ring is rated 5.0 out of 5 by 2. Rated 5 out of 5 by Anonymous from Ring This ring is beautiful it's a very unique design I love it . And I've had lots of people comment on how nice it is .im Very pleased with it . Rated 5 out of 5 by Anonymous from Brilliant idea for a Christmas or birthday. So happy with my ring I had it bought as a present of my hubby but so it on line first and then started hinting for it for a birthday present..so many people have commented on it and said how beautiful it is..value for money as bought in the sale. I absolutely love it..so happy..